Escaping cold winters to relocate to the milder climate of Florida is a goal of many older Americans living in northern half of the country. Splitting significant periods of time between two residences, particularly if property is owned in both, can have important implications on a person’s estate plan. A number of states in the north have their own estate and inheritance taxes that are triggered when a person dies. And these might apply even if there is no federal estate tax. Further, where individuals have multiple homes, in various states, there is the potential for multiple jurisdictions to become involved. No one wants to leave family members with convoluted estate administration problems that could lead to higher expenses and even disputes in the family. When a person has property in more than one state, additional considerations and measures to ensure a smooth transition upon death should be reviewed with an experienced estate planning attorney. A discussion of how to address having property and residences in multiple states will follow below. Disposing of property after death is the principal concern of estate planning, and if nothing is specifically structured to streamline this process, surviving family members are likely to face the a court administered probate process. With property owned in two or more states, this would mean multiple court actions that could substantially impact the value of estate assets once creditors or probate-related expenses are satisfied. Setting up a trust to hold real estate is often the most effective way to avoid the need for multiple probate proceedings, and a trust allows the creator substantial flexibility in how the property is transferred to survivors. In addition to property disposition, for practical purposes, someone will need authority to take over financial and legal decisions and receive access to related accounts in the event of incapacity. 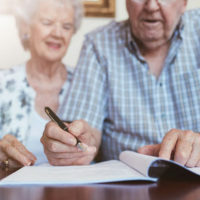 Each state has its own laws on designating an agent to perform these acts, and a comprehensive, carefully written durable power of attorney should be executed. In the event of incapacity, this fiduciary will need to pay ongoing living expenses and outstanding bills. Florida also allows the agent designated in a durable power of attorney to have access to and administer the principals digital assets following incapacity when this is provided for in the power of attorney document. Finally, at the end of a person’s life, there is often the need to make critical and quick medical decisions about the type of treatment and level of intervention doctors should administer. Frequently, the patient is unable to voice his/her own wishes on these issues due to physical or mental impairments. Advance directives are documents that express the patient’s wishes on end-of-life measures (living will) and designate a healthcare surrogate to make other medical decisions. To be safe, advance directives should be executed in all states in which a person lives for substantial periods during the year. An experienced estate planning attorney can advise on additional issues that apply to a person’s specific situation. Enjoying the benefits and features of living in different parts of the country throughout the year is a nice reward for finding financial success earlier in life. Making sure all your assets and affairs are properly accounted for in this situation is important for the financial security and peace of mind of your family. William Rambaum, P.A. is a Florida elder law firm that offers clients estate planning services and advises them on how to best accomplish their long-term financial goals. Contact the Oldsmar office today to schedule an appointment.